For me I think this New NAZA KIA Forte will change entire perception about Korean car, hence next time you will not see ppl mention any sentence above. I personally think that it’s like Samsung where ppl will not buy or even thing for their appliances compared to Japanese brand like Sony or Panasonic etc, but now what you think about Samsung? Is the similar case. 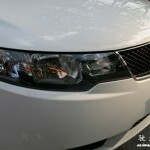 For the spare part I think it should not be a problem as this NAZA KIA Forte will be CKD soon instead of CBU, so those spare part will be localize and furthermore it’s selling like hot cake and got positive review from Singapore and the price of this Forte is increasing in Singapore. 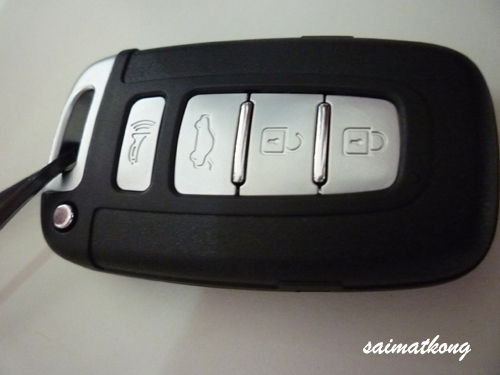 Keyless entry button, you need to press the button with the keyless remote in your pocket near you! 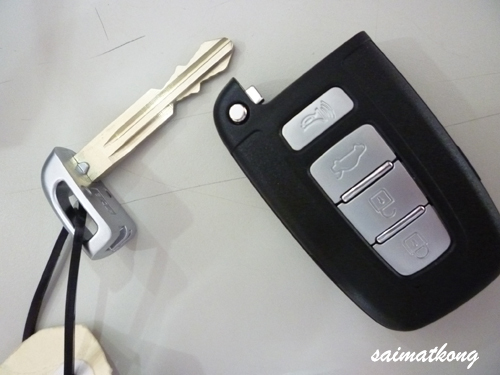 There’s actually a key in this remote, check it out and this key is for emergency case like your remote is out of battery so you can’t enter the car, so you need to use the key to open your High tech NAZA KIA Forte, then use the charging dock to charge it before you start the engine! 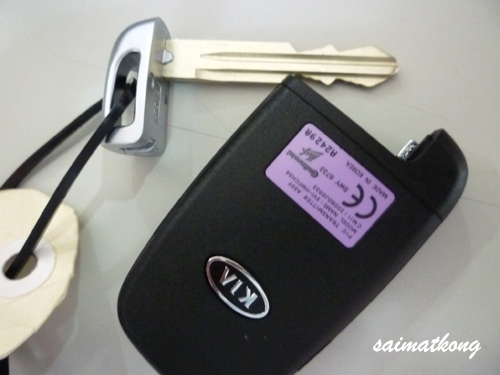 Coz you need batt in the remote for you to start your car too, if not it will not able to detect your remote key! Push start button and the charging dock for the keyless remote. There’s a safety feature implemented too, if you forget to take the remote out / leave your remote in the car, it will not allow you to lock your car! It’s a smart car don’t you think? Haha. 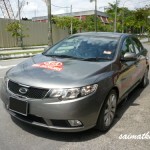 Go book your All New NAZA KIA Forte now for the CBU before it’s too late and regret getting CKD! If you are considering, pls consider higher specs of 1.6 which is 1.6SX or 2.0SX, don’t ever think about saving your money and get the lower specs 1.6EX which the interior is bad plasticky look / feel, no Air bags, not reverse assist, not 17″ alloy rim, no push start, no this and that… Haha. Go to try out yourself and now tell me is this worth or not compared to those Japanese car like Honda City, Toyota VIOS which is only in B Segment where else this NAZA KIA Forte is in C Segment! Yeah. Really nice alternative to Civic or Altis or Lancer. Would you buy a Samsung LCD/Plasma? Compared to Panasonic or Sony … I don’t think so. The people’s perception is still there one … and that’s the toughest thing to change. Nothing wrong with Samsung ah. I’m using Samsung phone also. Samsung LCD/LED HD TV is also one of the leading brand here. It’s even more expensive than Panasonic wtf. My first choice will be Samsung LCD TV if not for their more expensive price than Panasonic. ahaha for those saying ppl only buy sony LCD instead of samsung, you need to know tht samsung is the one that supply the LCD screen to SONY. 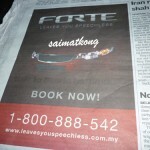 Good one saimatkong!! – love at 1st sight after seeing the car… in M’sia. hahahah… Soo Kah Kionggg pleaselah….. Be realistic looo. Now days most of the components in ur Sony brand are made of Samsung parts and even Haier. Go ask the dealer loh…. My Sony TV LCD alst for 2years only. The power board kaput.. cost Rm1000. 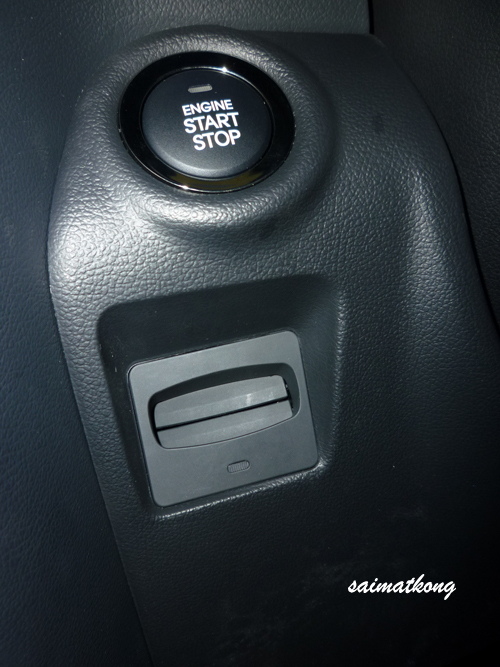 Kia doesn’t offer this keyless ignition in canada. How would i get my hands on these parts from kia, so i could install myself? sorry Bill, maybe you could ask your country service center. sorry, mind to tell me what is b-segment and c-segment ?? thanks. 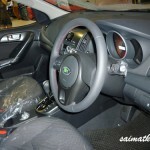 so excited with this Kia Forte…. The success of Kia is not happened in 1 day. The hardwork and strategic planning have contributed a lot…and make them the 5th largest car manufacturer in the world…. 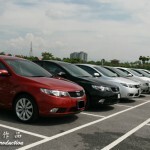 I am about to walk into Kia Singapore showroom to book a 1.6 SX(A)forte. 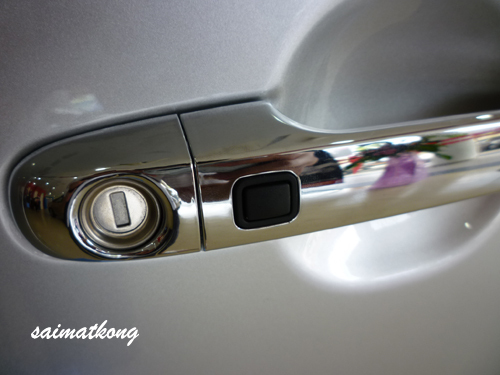 As far as I know from http://www.sgcarmart.com, none of the Forte SX (A) model has this keyless entry feature. Wondering if this is an add-on feature, available in Singapore, when ordering the car and how much it will cost? 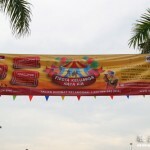 hi guys, i would like to seek you guys advise on kia forte comaprison to Honda city. im in the verge off getting a new car, initially was honda city but after the introduction of forte make me wanna think twice about my choice. can you advise me on the care performance and pretrol concumption between this 2 cars? and im abit worry with the electronic starter wil cost alot problemin the future. saw this car on exhibition the other day and the salesman said the fuel consumption is about RM15/100KM. 8.333L / 100KM it’s around the FC most ppl getting. I can get 6.6L sometimes using highway. depend on ur driving style and it’s not too high. adoi saimatkong…ur 2nd last paragraph really hurt EX owner lor.. I am considering either Kia Forte or Honda City. Can anyone confirm whether all the specs/accessories provided above actually comes with the OTR price or must add-on? I don’t know anything about these 2 cars other than they look damn nice so some advice would be helpful. 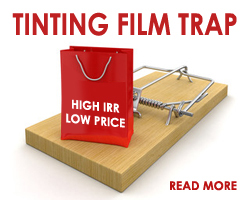 Can anyone tell me what the hire purchase interest is now? waiting list will be 3-4months i guess. check with the branch. if you do not have a sales person then I can intro you. 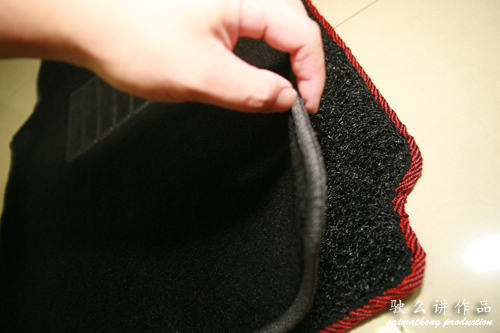 saimatkong, pls introduce me the sales person. where is him? Thanks for the info, guys. Wow, waiting list is 3-4 months? Honda City is 6 months. Friends are now advising me against getting a Kia, they said no resale value. What’s your opinion? But if I compare the City to the Forte, the Forte has better specs and accessories right? actually if you go to some branch there’s ready stock u just need to search for it, or u want me to give u some contact? obviously if you ask me Forte is the best out of all and value for money. no? Yes, the Forte is definitely value for money compared to Honda. Though that’s the case, I’m still concerned about Kia’s resale value as I’ve never owned a Kia before. I guess most people would go for Honda cos of the established brand. Please give me the contact of the Kia branches, I’ll call them once I make my decision. Thanks! Just got car. Stated as CKD but it is almost CBU..tyres, stickers etc. Now, I like to get a bodykit. Anyone can inform where to get a cheap Singapore bodykit in KL? hey fortelady, join us in myforteclub.com or fb or lyn to discuss as there’s a lot of different sources.